Watersafe® Well Water Test Kit was specifically designed to help you test quickly and easily for the most common contaminants found in private well water, including: iron, copper, lead, bacteria, pesticides, nitrates, nitrites, chlorine, pH and hardness. If your home draws from private well water, regular testing (recommended yearly or more) is the only way to ensure the purity of your water and safeguard the health of your family. You will be responsible for testing your drinking water not the city, and Watersafe® Well Water Test Kit is kit can help you. 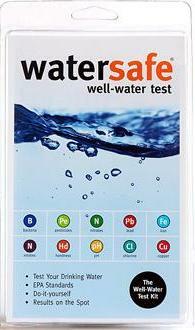 This is an affordable, easy-to-use and accurate test to determine the safety of your well water! Watersafe® Well Water Test Kit is an essential addition to every home drawing from private water wells, giving you lab-quality results right in your own home. The EPA recommends testing your private well water at least once a year, so don’t wait! The quality of underground water can change due to various reasons. Put your mind at ease and help secure your family’s health with a Watersafe® Well Water Test Kit. Keep test out of reach of children or pets. Do not ingest anything from this kit. Do not drink samples used for testing. Store and use at room temperature (60-86 F). Do not use with hot water or water containing bleach or detergents. Do not re-use any part of the test kit. Do not open packets or vial until you are ready to perform the test. Read and follow all instructions carefully. <> The Watersafe® Lead Test can detect dissolved lead at levels below the EPA Action level of 15 parts per billion (ppb). Folks this is one test you should have. <> In the US about 1,000,000 children under the age of six have a blood lead level exceeding the level of concern. Just take 10 minutes to protect your family from the damaging effects of lead. 1. Open Lead packet and take out all contents. The packet contains a test vial, a dropper pipette, two Watersafe® Test Strips, and a desiccant (to be discarded). 2. Using dropper, place exactly TWO dropper-fuls of water sample into test vial. To pick up the sample, tightly squeeze the bulb at the end of the dropper and place the open end into the water sample. Release the bulb to pick up the sample, then squeeze again to expel the sample into the vial. 4. Place both test strips into the test vial, with arrows pointing DOWN. 5. Wait 10 minutes. Do not disturb strips or vial during this time. Blue lines will appear on the strips. 6. Take the strips out of the vial and lay them on a flat surface with the arrows pointing to the LEFT. If you only see the LEFT line (next to number 1), the test is negative. 7. Note: If no lines appear, or both lines are very light, the test did not run properly and the result is not valid. If a test strip shows a positive result, your water sample may contain lead or pesticides at a toxic level. Use this test to check for the presence of bacteria in your drinking water with this do-it-yourself, EPA-based test kit. This tests for the presence of Coli form Bacteria in your water. The presence of bacteria in drinking water is usually a result of a problem with the water treatment system or the pipes which distribute water, and indicates that water may be contaminated with germs that can cause disease as stated above. Keep tests out of reach of children or pets. Do not ingest anything from this test kit. Do not drink water sample used for testing. Do not open packets or vial until you are ready to perform the tests. Collect water sample or turn on tap to a very slow stream. Carefully twist off cap and fill vial to 1/2 inch below the top (to 5 ml line). DO NOT OVERFILL and DO NOT SPILL the bacterial growth powder in the vial. Replace cap and twist on tightly. Shake the vial vigorously for 20 seconds. Place the capped vial upright in a warm area (70-90 F) where it cannot be disturbed for 48 hrs. <> (No bacteria were detected) <> (It is highly likely that potentially harmful bacteria were detected). For positive results, add bleach to the sample before pouring down the toilet, then wash hands carefully. Negative samples may be poured directly into the toilet. Discard vial in the trash. The Watersafe Pesticide test kit is a one step test kit that detects two of the most common pesticides (Atrazine - 3 ppb and Simazine - 4 ppb) used in the United States at the EPA maximum contaminant level. Results in 10 minutes. If you car concerned about pesticides on your produce, then you should be also concerned about pesticides in your drinking water? Now you can test your water for harmful pesticide contamination-safely and accurately. Keep tests out of reach of children and pets. Do not ingest anything from this test kit. Do not drink water sample used for testing. Store and use at room temperature (60-86 F). Open Pesticide packet and take out all contents. The packet contains a test vial, a dropper pipette, two Watersafe® test strips, and a desiccant (to be discarded). Using the dropper, place exactly TWO dropper-fuls of water sample into test vial. To pick up the sample, tightly squeeze the bulb at the end of the dropper and place the open end into the water sample. Release the bulb to pick up the sample, then squeeze again to expel the sample into the vial. Swirl vial gently for several seconds. Place on a flat surface. Wait 10 minutes. Do not disturb strips or vial during this time. Blue lines will appear on the strips. Take the strips out of the vial and lay them on a flat surface with the arrows pointing to the LEFT. If levels of chlorine, hardness or pH are too high, your water could be damaging your plumbing, your pocketbook, and your health. pH - <> If the acidity of your water is too high, corrosion can leach out lead from pipes and damage your water supply system and water heater. Hardness - <> lime scale builds up in pipes causing corrosion, reduce the efficiency of hot water heaters, and require more water to remove soap. 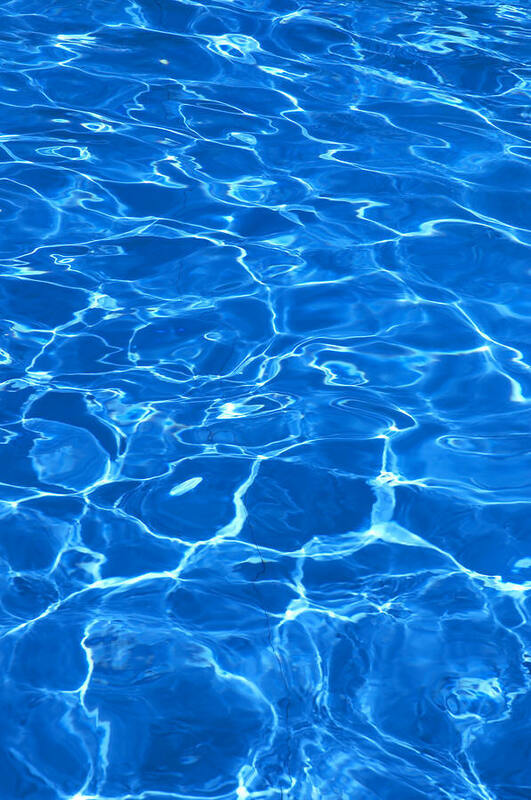 <> Chlorine - can increase cancer risk; bad taste and smell. 1. Carefully open pH/Hardness/Chlorine Test packet and take out test strip. 2. Immerse the reagent pads into the water sample and remove immediately. Hold the strip level for 15 seconds. 3. Match pH, Hardness and Total Chlorine Pads (in that order) to the color chart below.